Home > Article > What was the Great Depression and why did it start in the USA? 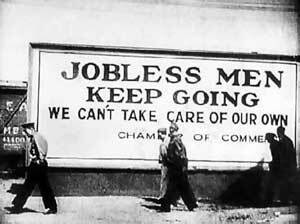 The depression was caused by a number of serious weaknesses in the economy. Although the 1920s appeared on the surface to be a prosperous time, income was unevenly distributed. The wealthy made large profits, but more and more Americans spent more than they earned, and farmers faced low prices and heavy debt. The lingering effects of World War I (1914-1918) caused economic problems in many countries, as Europe struggled to pay war debts and reparations. These problems contributed to the crisis that began the Great Depression. Wage income for workers who were lucky enough to have kept their jobs fell almost 43% between 1929 and 1933. It was the worst economic disaster in American history. Farm prices fell so drastically that many farmers lost their homes and land. Many went hungry. Faced with this disaster, families split up or migrated from their homes in search of work. 'Hoovervilles' (named after President Hoover, as an insult), shanty towns constructed of packing crates, abandoned cars and other cast off scraps sprung up across the Nation. Gangs of youths, whose families could no longer support them, rode the rails in box cars like so many hoboes, hoping to find a job. 'Okies', victims of the drought and dust storms in the Great Plains, left their farms and headed for California, the new land of "milk and honey" where they believed all one had to do was reach out and pluck food from the trees. America's unemployed were on the move, but there was really nowhere to go. Industry was badly shaken by the Depression. Factories closed; mills and mines were abandoned; fortunes were lost. American business and labor were both in serious trouble. Unable to help themselves the American public looked to the Federal Government. Dissatisfied with President Herbert Hoover's economic programs, the people elected Franklin D. Roosevelt as their president in 1932. Roosevelt was a bold experimenter and a man of action. Early on in his administration he assembled the best minds in the country to advise him. This group of men were known as the 'Brain Trust.' Within one hundred days the President, his advisors and the U.S. Congress passed into law a package of legislation designed to help lift the troubled Nation out of the Depression. Roosevelt's program was called the 'New Deal.' The words 'New Deal' signified a new relationship between the American people and their government. This new relationship included the creation of several new federal agencies, called 'alphabet agencies' because of their use of acronyms. A few of the more significant of these New Deal programs was the CCC (Civilian Conservation Corps) which gave jobs to unemployed youths and to improve the environment, the WPA (Works Progress Administration) gave jobs to thousands of unemployed in everything from construction to the arts, and the NRA (National Recovery Administration) drew up regulations and codes to help revitalize industry. Later on came the creation of the Social Security System, unemployment insurance and more agencies and programs designed to help Americans during times of economic hardship. Under President Roosevelt the federal government took on many new responsibilities for the welfare of the people. The new relationship forged in the New Deal was one of closeness between the government and the people: a closeness which had never existed to such a degree before. Although Roosevelt and the New Deal were criticized by many both in and out of government, and seriously challenged by the U.S. Supreme Court, they received the overwhelming support of the people. Franklin D. Roosevelt was the only president in U.S. history to be elected for four terms of office. Despite all the President's efforts and the courage of the American people, the Depression hung on until 1941, when America's involvement in the Second World War resulted in the drafting of young men into military service, and the creation of millions of jobs in defense and war industries.